ABCE ANALYSIS - While British newspapers' websites posted record global traffic for October, their UK-specific audiences are expanding more modestly, analysis of ABCe data shows. MailOnline posted a massive 18.3% surge in its worldwide unique user base between September and October. However, its UK unique user base increased at a slower rate month on month, of 12%. Similarly, the global expansion of market leader Guardian.co.uk of 7.4% between September and October was just 3.5% in the UK over the same period. That said, the site can still claim to have the biggest UK unique user base of any UK newspaper website. Emily Bell, director of digital content at Guardian News and Media, said: "Not only are we almost breaking the 26 million barrier but we are the first UK newspaper website to attract a record-breaking 10 million plus UK users." Telegraph.co.uk, with 23.2 million worldwide unique users in October is the UK's second most popular UK newspaper website, up 1.15% month on month. However, this top line increase masks the fact that its UK unique user base actually declined between September and October, by 2.3%, from 7.2 million to seven million last month. Further analysis of the October ABCe data shows the extent to which overseas traffic boosts UK newspaper sites overall numbers. In recent months, several newspaper publishers have appointed dedicated sales organisations to generate increased revenue from their overseas traffic. Last month, the proportion of Telegraph.co.uk's worldwide unique users which came from the UK, 30.2%, was lower than any other UK newspaper website in the ABCe report. Meanwhile, MailOnline's UK unique user base accounted for 30.4% of its global audience, while The Sun Online's UK unique user base commanded 38.1% of the site's global unique user figures. However, leading the way in terms of having the biggest proportion of its total unique users logging on from the UK, was Mirror Group Digital. Analysis of the ABCe figures shows that 57.7% of its total unique user base logged on from the UK last month. In absolute terms, however, it should be noted that Guardian.co.uk posted the biggest UK unique user base last month, of 10.1 million. 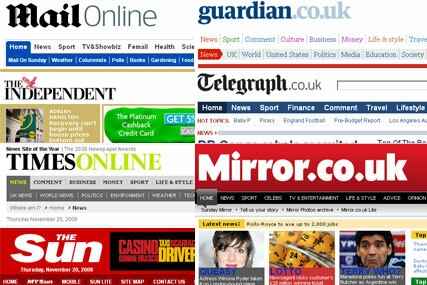 David Black, group director of digital publishing at Trinity Mirror, said: "We are continuing to grow our UK audience - our focus has and remains the UK audience. That is where the Mirror brand has relevance and that is where the commercial opportunity is."